When boarding a plane, settling in for a comfortable flight is likely a top priority—reclining your seat, kicking off your shoes, and stashing your belongings away in the bins to prep for the long haul. But one passenger's comfort can be (and usually is) another's pet peeve. While these all seem like relatively minor offenses, learning about a few common pain points (and how to compromise) can ease the journey for everyone on board. Just whose armrest is it, anyway? Well, if you're in the middle, more power to you if you want to seize sovereignty of armrest territory: the window and aisle already have one each of their very own, thus, the middle seat gets both the interior armrests. Feel free to enlighten an armrest-stealing seatmate regarding this rule. Better yet, don't get stuck in the middle -- choose a window or aisle seat when you buy your ticket. Have you ever boarded a plane to find the overhead bin above your empty seat row is already full? It turns out that some travelers keep an eye on their bag by storing it one row ahead of where they're sitting. These passengers are afraid that someone will steal their bag, so they place it in an area where they believe they'll be able to notice if it's taken. We've never heard of someone stealing someone else's carry-on bag, and think it would be incredibly noticeable and quickly resolved if someone was to try it. The problem with this tactic, though, comes when you then have to walk to a different area of the plane to find a free spot, then squeeze your way back to my seat. Then the passenger whose seat is there won't be able to place their bag above them, and the pattern continues. If this happens to you, then you'll need to practice Zen and the art of calmly waiting for everyone to get off when the plane lands, rather than shouldering your way down the packed aisle to retrieve your carry-on bag. When you board the plane, try to put your bag up in the overhead cabin bins and sit down in your seat as quickly as possible. It can be frustrating for everyone except (apparently) the person doing it to watch someone stand in the aisle and rummage endlessly in a bag inside a bin whilst everyone else waits, bags on shoulders. So, before you board, stash what you want for the flight -- laptop, book, energy bar, lip balm -- inside the small carry on you'll keep at your feet under the seat in front of you. Stow your bigger bag in the overhead bin, sit down and then rummage to your heart's content. Nothing gets an air traveler more worked up than the person in front of them reclining their seat. If at all possible, do not recline your seat. Yes, airline seats are shrinking, but you reclining your seat means that the person behind them has to recline their seat, and so on, until everyone's annoyed and leaning slightly backward. The advice offered by etiquette experts seems to be to do whatever you politely can or suffer in silence if you're on the receiving end; if this is your first time in the air, know that reclining your seat more than two inches is going to make the person behind you fairly sad for several hours. If they're polite passengers, they won't be reclining their own seats and thus, thanks to you, your head will practically be under their noses. It's also an invitation to get your seat banged from behind as the squished passenger tries to get into their under-seat carry on despite the seatback in his/her face. Oh, and you can break the open lid of the laptop on the seatback tray behind you by quickly throwing your seat backward. If you must recline, do it slowly enough (after turning around and mentioning that you're about to do it) that the passenger behind you can move spill-able, breakable stuff out of harm's way. If you're sitting in the window seat and have control of the window, other people may not want to sit in darkness or be unable to see the bright blue sky outside their window, and it's nice to be respectful of that. One thing you could do if you like the shade closed is to ask your seatmates how they feel about it. If they don't mind whether you close it or not, feel free to keep it shut for the flight. If they do want it open, you could offer to trade seats with them, so they get the window and you don't have to spend the flight trying to avoid looking out of it. ​There's nothing more annoying than having to sit and listen to somebody having a phone conversation on a flight -- everyone can hear you and nobody can escape. 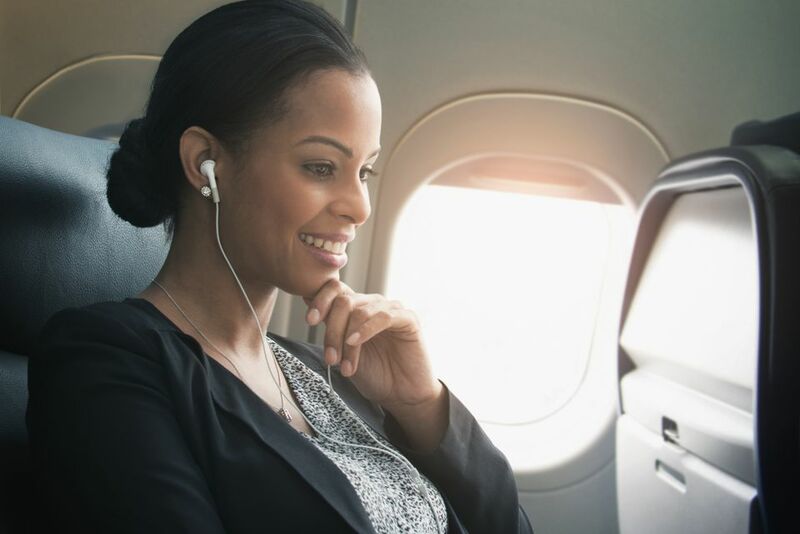 Whether it's making a phone call with your phone or calling someone from Skype to show that you're online at 35,000 feet, keep your conversation quiet and no longer than a few minutes.